Hope you like the look and wish you a fantastic week!! lovely outfit!love the styling.amazing shirt and bag.those studs are so cool! u look so cool! i adore each item! Love the whole outfit! You look gorgeous as always Melina! I love all the studds! Love the stud wang bag!! and those shorts are perfect for summer! I'm having a you choose cashmere giveaway on my blog, please pass by and enter I think you'll love it! love the bag and shorts! Thank you for your lovely comment :)You look great! I'm your follower now! Thank you for coming to me and comments on my blog I have .. I like your bag! Nice outfit! You look amazing in this outfit! A bit edgy yet chic, I like it! Love the outfit!!! amazing short and bag. Oh I love that bag, it is amazing! 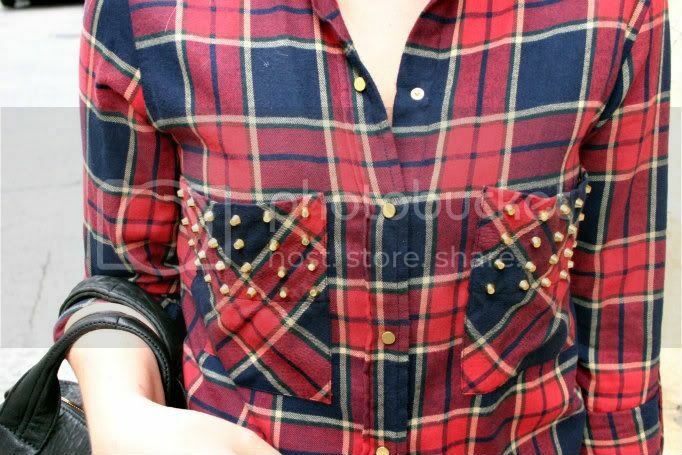 Love those studs! So edgy. Love the whole look! The shorts and bag are super cute! awesome outfit, love sooo much the bag!!! Gladly follow you via Gfc, Bloglovin and Facebook. I would be happy if u could follow me on all of this networks. I am now following you and hope to see you again soon on my blog! Love the shirt and bag! What a lovely blog! I just followed you ! And you have such a gorgeous style! Love it!